Get ready for Hillbilly Days 2013! 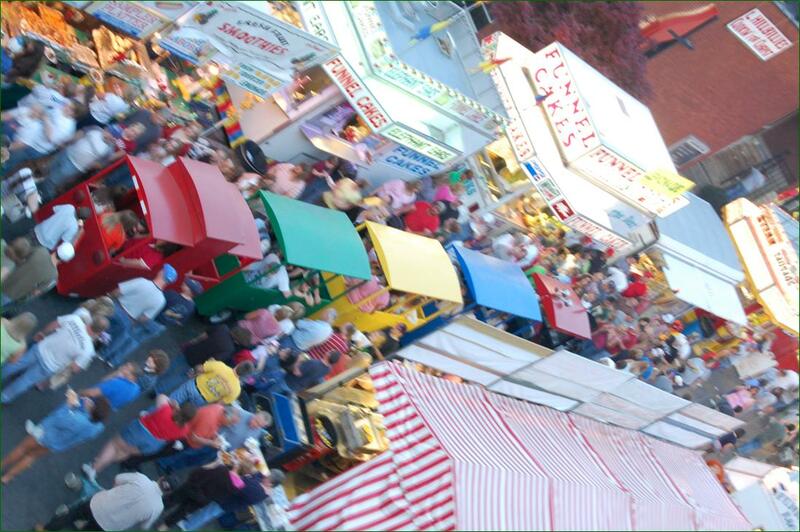 Hillbilly Days 2013 will be bigger and better than ever. With over 250 vendors, 25 carnival rides, and over 150,000 visitors expected, the festival is sure to break all records this year. The festival will be held Thurs., April 18th thru Sat., April 20th in downtown Pikeville, where festival-goers can get traditional Hillbilly food and entertainment. With four stages, bluegrass music can be found all over – especially on the City Park stage as well as the Courthouse Stage. For those who enjoy more of a variety, the Expo Center Stage and Pepsi Stages will offer country, pop, bluegrass, and more. The Appalachian Wireless Fireworks Show will be held, weather permitting, on Thursday evening thirty minutes after dark. If Thursday brings rain, the fireworks show will be held on Friday, 30-minutes after dark. The Carnival, now titled Gold Medal Shows, will be held in the Riverfill and will offer traditional favorites along with new rides such as Jumping Dumbo, Sea Ray and Ring of Fire. The carnival will open on Wed., Apr. 17 at 6 PM with armbands at $20 or $15 with coupon (which will be available in upcoming newspapers). Thurs. – Sat., the carnival will be open 10AM – 11:30PM, with armbands available until 2PM and honored until 3PM. After 3PM individual tickets will be required and are $1.25 per individual ticket. Armbands will not be honored after 1 PM on Saturday. The Hillbilly Days Parade will be on Sat. at 2PM throughout downtown Pikeville. For information on the parade or how to enter a float, contact Pikeville Tourism at the City of Pikeville at (606) 444-5286. Vendor booths will be located all throughout town, with the majority of booths being on Hambley Blvd., Huffman Ave. and Main St. The Chamber is bringing the traditional favorite booths back as well as some new additions. Maps of vendor locations can be found at www.hillbilly days.com. The EQT Craft Bazaar will feature an array of arts & crafts vendors and will be on the first level of the parking garage. Because this area is being utilized, a few parking regulations have been put into place. In regards to event parking: the top levels of the parking garage will be open on a first come first serve basis. You will have to use the Hambley Blvd. entrance. Vehicles will no longer be able to park along Bypass Road or on sidewalks, and the Pikeville Police Department will ticketing those who disobey this new rule. The no parking rule also applies to vehicles parked exclusively on grass, if the vehicles must drive across a sidewalk to get there. Parking along the sidewalk creates hazards for pedestrians who must walk into the roadway when cars block the sidewalk. Several detours have also been put in place during the festival: Hambley Blvd. will be closed from Pike Street to Elm Street. Pike Street (North): drivers will be able to turn on Pike Street to go to Main Street, turn left on Main Street, and at the end of Main Street will be able to turn right on Don Combs Bridge to the By-Pass. Elm Street (South): drivers will have to turn around and go back to Baird Avenue and take the By-Pass around. 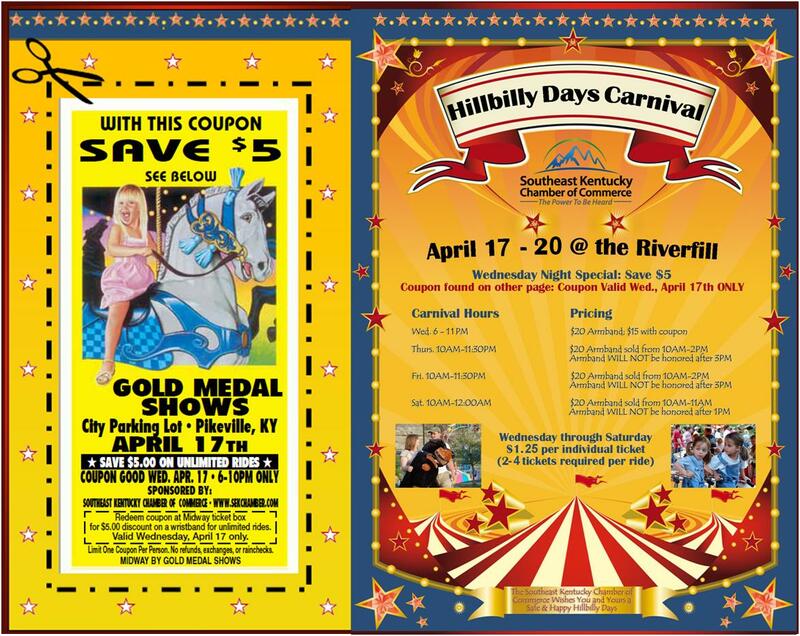 The success of Hillbilly Days is not possible without the vision and dedication from the Southeast Kentucky Chamber of Commerce, The Shriners: Hillbilly Clan #1 Outhouse #2, the Pike County Fiscal Court, the City of Pikeville, Kentucky Power, Pike County Tourism, City of Pikeville Tourism, UMG, and all of the wonderful Chamber volunteers. Chamber staff Pam Mullins, Jondra Branham, Lisa Trivette, Jim Workman and Chamber President/CEO, Jared Arnett work year round to prepare for this festival. “It takes many months to coordinate over 250 vendors to insure that everything runs smoothly, and the efforts of the office staff definitely work to make the festival come together each year ,” Arnett said.